If you drive a vehicle even weekly, there is a strong chance you will be confronted with a flat tire. Flat tires are very common, especially on unincorporated roads, but they are not difficult for the average person to repair. They require no specialize knowledge unlike many modern car repairs and can be fixed in a matter of minutes. When it comes to tire repairs there is one tried and true method. The most common resolution to a flat tire is to simply change the tire. 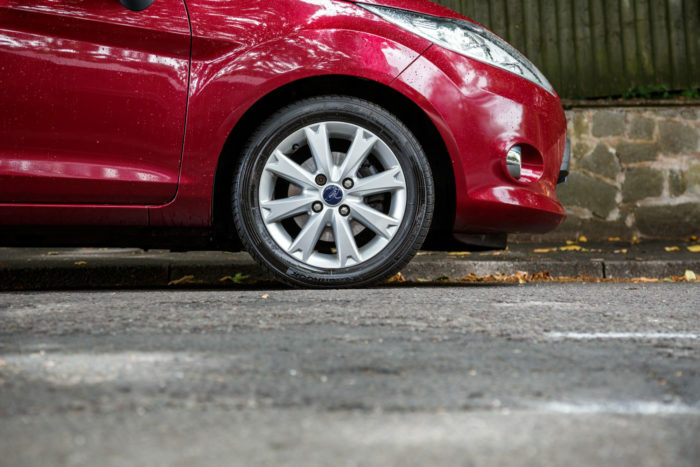 Almost every vehicle contains a spot to fit a spare tire, even on compact cars. Check the trunk or hatchback under the flooring for a spare tire compartment. Many off-road vehicles hook them on the rear gate, and truckers can simply store their spare tire in the bed of the truck. Before you jack the car, it is crucial you take the lug nuts off the damaged tire. With your spare tire and jack, there should be a lug wrench. Remove the hub cap from the wheel and then use the lug wrench to remove each lug nut. With your spare tire and lug wrench, there should be a jack. Once again, most cars have a space to store a portable jack, usually with the spare tire. When receiving a new car, it is wise to check for a spare tire, jack, and lug wrench in the vehicle. When buying a used vehicle, the previous will often keep one or more of these items. With these three pieces, you have everything you need to change the tire. If you can, find solid flat ground. Do not drive on a flat tire any further than you have to or you’ll bend the rim. Make sure your car is in park before you begin the repair. Jacking a car in dirt or grass can drive the jack into the earth instead of the car into the air. Always jack a car on concrete or asphalt. If you cannot find flat ground, turn the steering wheel all the way to the side so the car can’t roll on top of you. As an added safety measure, you can brace the tires with blocks to prevent them from rolling. Once your car is secure, look under the car for jack points. Jack points are specially marked portions of the car where it is safe to place a jack without damaging the vehicle. Each car is different. Some jack points are marked with a strip of metal on the bottom of the frame, other jack points will be marked with a notch or check mark. Insert the handle into the jack and slowly rotate it. You will only need to lift your car an inch or so off the ground to replace the tire. Once your damaged tire is off the ground, remove it and replace it with the spare. Be sure to re-attach the lug nuts as tightly as possible. Place your damaged tire and hubcap in the car with your jack and lug wrench, then find your nearest car repair place. Experts advise that you drive no more than seventy miles on the spare tire. It is not designed for regular use, but instead it is an emergency tire only recommended for emergency situations.